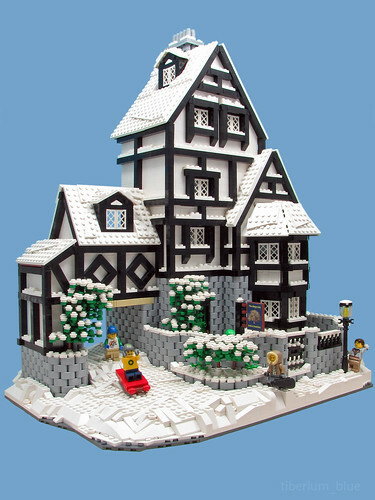 Brick Town Talk: Breakfast in Bed - LEGO Town, Architecture, Building Tips, Inspiration Ideas, and more! Old Mount Road - (BTT) Forget the big chain hotels - there is nothing like the charm of a good bed and breakfast. The Sleepy Oak Inn has been treating travelers to a one of a kind experience for years, and now that the snow has hit the ground, there is all sorts of fun to be had on the hills. Should the cold be a little too much, spend a little time in the cozy interior, warming up next to the fire.